A post is the primary product that eternally earns revenue for Sangkrit. Therefore Sangkrit should always be embedding almost everything in to this only. Thus we work hard for expanding the searchable knowledge index of humanity and it incessantly gets distributed worldwide upon handheld devices. That works like Universal Free Homeschool Of Internet Age. It feels truly great building this constantly by publishing latest lessons. 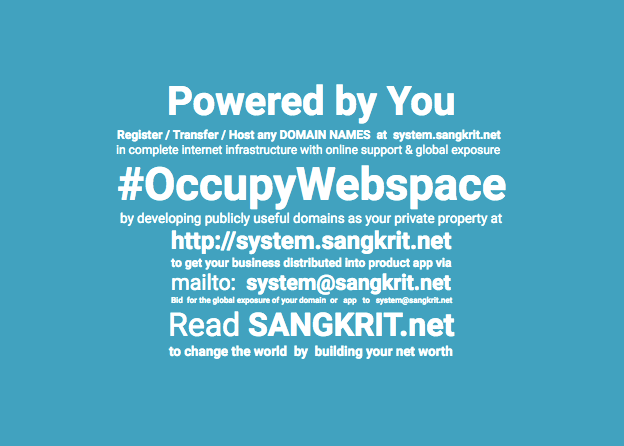 This continuously makes SANGKRIT.net the most global media on planet Earth generating worldwide exposure as its daily virtual worth. That can exclusively get sold to make anyone globally glorious. This provides greatest possible leverage upon internet growth in addition as the most of the money is duly reinvested in expanding the searchable knowledge index of humanity.